La escoba de Dios. That pretty much can describe any pick in Patagonia. On top of Aconcagua even more so! Thanks for the piece KC, brought up some memories. PS: how’s that leg? Are you trying acupuncture? Somehow, after a lifetime of reading about Patagonia, this post helps me to get it what you’re actually climbing on up there on the world’s single most difficult summit. See, I think I was seduced by phrases that were daunting even as they were dismissive, carrying on about how it’s “just a transitory ice mushroom” up there. The idea of an ice mushroom brings to mind scraping your points on a flinty surface, where you are describing an actual wallow up sugar snow, more like the stuff of those fluted faces further north in the Andes. All this time I was imagining getting blown off one’s front points because they barely scratched purchase, while you’re describing stuff so wallowy that upness is the supreme problem. This is a revelation because, well, as a fellow mountaineer my first question is always about what’s the actual texture of the terrain you’re working anyway? Some type II fun stories need to be retold and never get old. Thanks for sharing. Good luck with the AAJ deadlines. Don’t let them change the name of the club either. 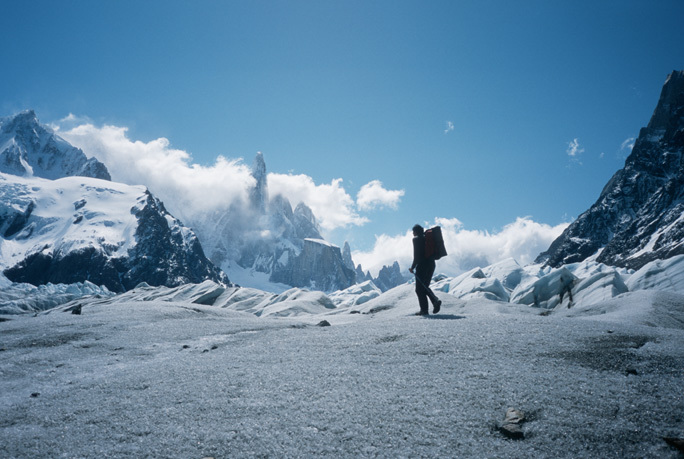 It’s true what they say about Patagonia catalogs being like books – that must have been my fifth time reading that Field Report, and it still shocks me how incredible a situation it must have been. Plus that photo is probably one of the sickest Torres shots ever.